Just received report so here it is. (08-17-2018, 12:24 AM)ChrisH Wrote: Just received report so here it is. Picture of original invoice and reproduction of window sticker. Nice to have the original invoice! Gold glow with forged wheels is a very nice combination for the 73 Mach ! Since your car came with Floor Mats I thought you might need to know what they look like. Most think they are aftermarket due to the fact there is not Mustang name or logo on the front. They do have Ford LOGO and Ford part numbers on the back side. They would have been Ginger for your car and have carpet inserts. You only got the fronts from factory and you had to order rear from the dealer. If you have them do not toss very difficult to find. I have my original ginger and a set of Vermillion I found on ebay. Thanks. I think it’s very cool that the original invoices are still obtainable. I really like having some of the cars history, I’d like to have even more. I haven’t begun to look for mats yet. I don’t have the originals, there wasn’t even any carpet left in it. I’ll add them to a very long list of stuff to be on the lookout for, at least now I’ll have the part numbers and how they are supposed to look. I do find it odd that it specifies that your only getting front mats, they couldn’t even give the buyer a complete set. Thanks again! Good luck finding a set of front ginger/brown mats. I have been searching for years with no luck. I once found a decent set in the trunk of a 73 vert for sale, but I would have had to buy the whole car to get them. Have look for and found your cars build sheet? I have not looked for the build sheet but ther are not too many place inside the car that are not exposed so I don’t have much hope of finding one. Where are some of the places that they can be found? (09-14-2018, 12:20 AM)ChrisH Wrote: I have not looked for the build sheet but ther are not too many place inside the car that are not exposed so I don’t have much hope of finding one. Where are some of the places that they can be found? 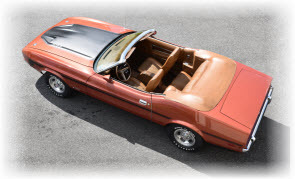 Nice Mach 1 - I have the same configuration: 1973 Mach 1, Q-code, 4-speed, Gold Glow, Ginger interior. Also have the 3/4 vinyl roof and it's a T5... Love that combo!